What was it like to fight for the FARC? 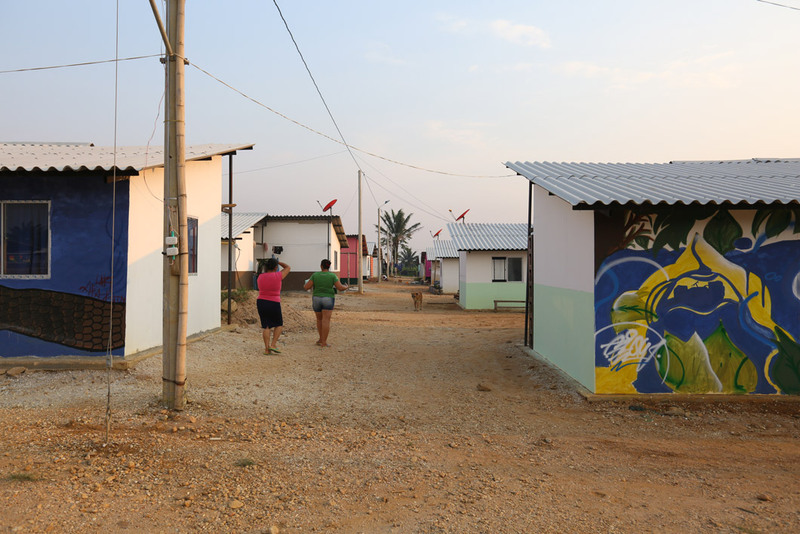 It’s five in the morning in the FARC reincorporation camp Agua Bonita: The former fighters of what was Colombia’s most-feared guerrilla group until last year begin their work day early, exactly like they did during their armed conflict with the state. But instead of preparing their weapons or planning military strategies, they prepare for a day in the fields, taking care of their newly planted crops. Others start working on new constructions in the village or make their way to the school lessons – a Spanish literature class is on the schedule today. 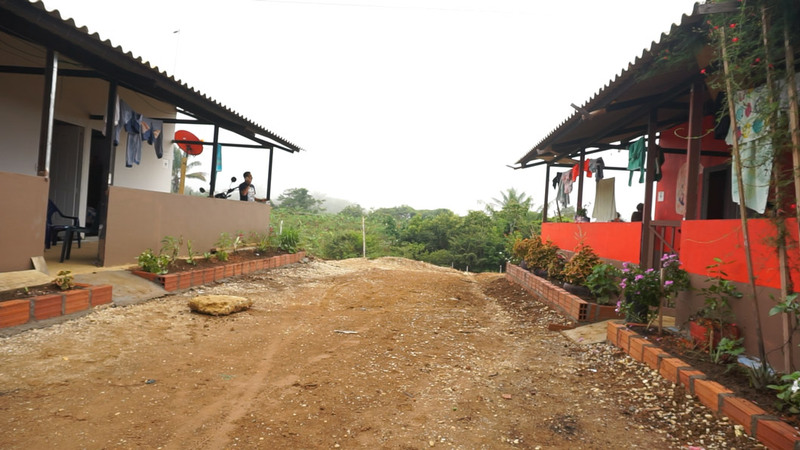 Agua Bonita is one of the country’s 26 ‘Territorial Spaces for Training and Reintegration’ (ETCR), located an hour’s drive from La Montañita, in the southern department of Caqueta. When the FARC put their arms away and moved to the transitional camps, journalists started to visit, publishing articles and shooting videos. That was when Carlos Adrada, a young member of the organization, decided it was time to also tell their own stories. Together with fellow members of the guerrilla, he published a book containing seven auto-biographical texts of former combatants. “Una guerrilla por dentro. Memorias de la Resistencia,” or “A guerilla inside. Memories of the Resistence,” gives a first-hand peek into their experiences and personal motivations to take up arms. Comprised of provisional one-story houses with tin-roofs, Agua Bonita is surrounded by tropical forest and mountain ranges, a river down a steep hill was its namesake. Step-by-step the guerrilla turned the zone into a lively little village, including a small market, a cafeteria, a football pitch, a hut for shoe production and basins to breed fish. It is here were Adrada’s book took shape: Together with three colleagues, he gathered former combatants to tell their stories and transcribed their narrations. How was their first fight? How do they feel about the process of reincorporation? Which plans do they have for the future? A further FARC member drew the illustrations. Most of them grew up in the countryside, in areas with a strong FARC-EP presence and decided to join the guerrilla in their teenage years, as alternatives were few and the guerrilla’s ideology seemed appealing. One of them is Arley Morales, who grew up in Caqueta. “The day I left my family, my mum killed a chicken, crying a lot, but she knew I would come visit and she would have food ready,” Morales describes in her chapter. Joining the FARC-EP was a topic rarely brought up within the family, but Arley was convinced that her parents would support her decision. Then she left for a three months training camp. She had her first fight in Las Margaritas in Caqueta, a difficult day, she writes, as all of them had barely finished their first training and had never been in a real fight before. Apart from memories of fights, the former combatants talk about details of everyday life with the guerrilla. Jorge Humberto Caballero spent some time in the mountains together with just two fellow fighters: “They really liked dry rice with Maggi sauce – all the time – and I was not used to that much Maggi, but there was nothing else.” Food was scarce and the fighters usually sustained themselves just with bananas, yucca, sugar and cacao, he writes, before going into details of different military operations. In the end of his narration, he says: “I am the happiest I have been in my life because the war stopped.” However, doubts about the implementation of the peace treaty and fears linger about a similar fate the Union Patriotica met with in the 80s. Adrada himself had worked for the FARC-EP in Cali since he was 18 years old – today he is 30. He was recruited through the Movimiento Bolivariano, which usually happened at universities and social movements. However, around 2013, he started to receive threats. “Once, the police took a classmate to the station to question him about me – what was I doing? Where was I working?” he said. Also, his family noticed they were being watched. So Adrada left Cali and joined the sixth brigade in Cauca, before moving to the ETCR Agua Bonita in Caqueta when the peace treaty was signed. 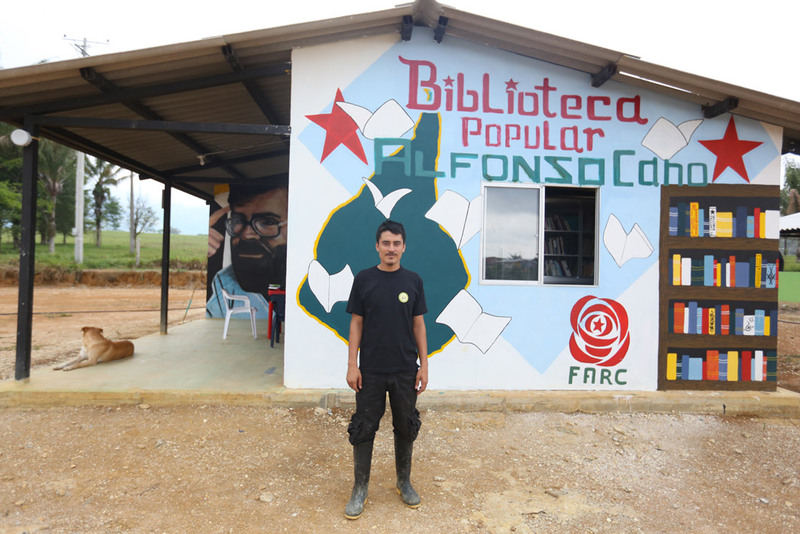 The idea to open a library came from the tradition of the FARC-EP’s mobile libraries. At the conference of the guerrilla in 1992, ”La Octava Conferencia”, leaders agreed that every combatant should always carry a book with him or her. “Cada guerrillero llevará un libro en su equipo,” or “each guerrilla man will carry a book in their kit” in it reads in the conclusion. However, keeping books was easier said than done in the context of war, Adrada recalls. “We were mobile, you had to carry your cloths, your food, the weapons, sometimes even the water – so the weight of books was a hurdle.” In attacks books often got lost. “In moments when you had to leave, you took your weapon and ran,” he says. Whenever different FARC-EP groups met, they exchanged their books. “So the books we had were rotating,” Adrana says. Most of the books covered philosophy, military instructions, political economy and history – mostly with socialist or communist background. But in addition to the fights, the humidity made it hard to preserve books for long. 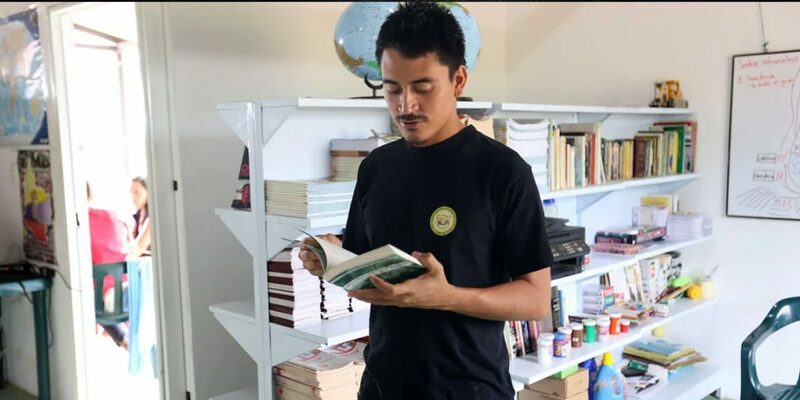 When the peace treaty was signed, Adrana and his colleagues started to collect what was left of the mobile libraries within the brigades that came to Agua Bonita. In combination with book donations they received from various universities and institutions, the Biblioteca Popular Alfonso Cano grew. “Putting away our weapons and coming to zones as this one, opened the possibility that people could come and get to know us a bit better,” he says. In the book they saw a format to reach out further, trying to move away from their militant past. Developing a tourism program, the ETCR Agua Bonita tries to open up and get into dialogue with visitors. They hope that tourism will supplement they money they make through agriculture and allow them to make a living. The FARC in Agua Bonita want to stay and find ways to tell their stories – “Una guerrilla por dentro” is one of them.